Africa’s humanitarian crises have continued to worsen in 2017. Displacement of Africans has reached twenty million, and 44 million are acutely food insecure. 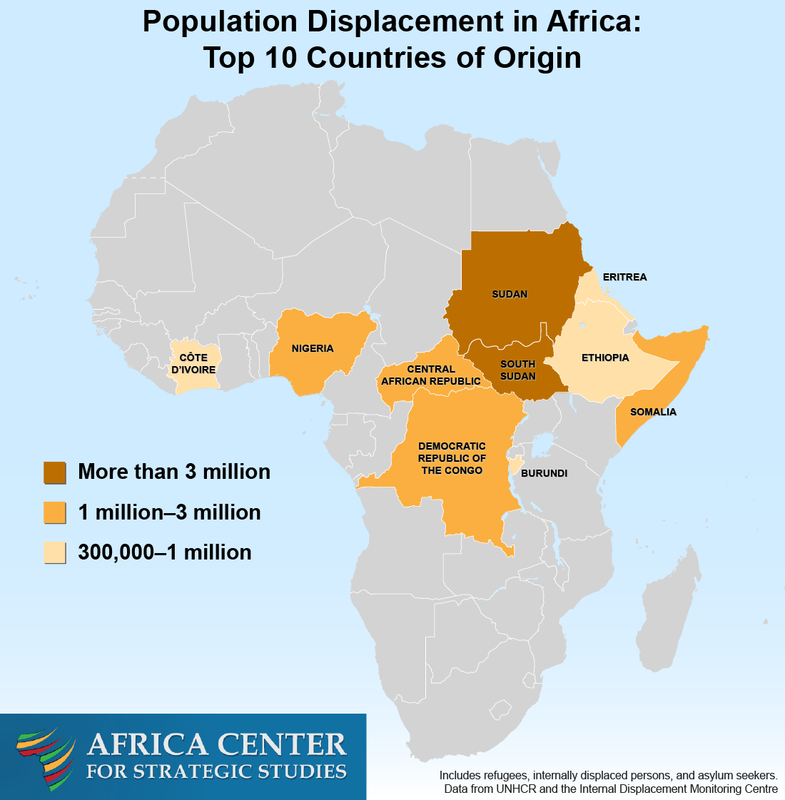 Almost 75 percent of Africa’s 20 million displaced persons are from 5 countries: the Democratic Republic of the Congo, Nigeria, Somalia, South Sudan, and Sudan. Each of these countries is experiencing serious conflict. 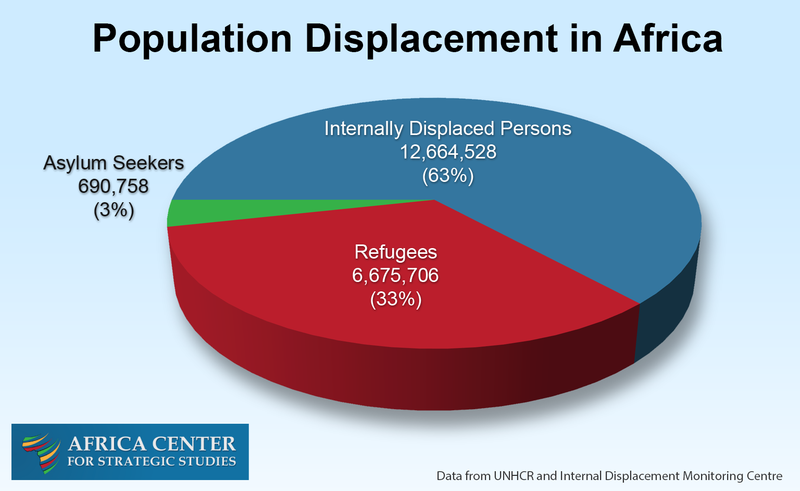 While global attention has focused on refugees, almost two-thirds of Africa’s dislocated population are internally displaced. The number of internally displaced people—12.7 million—represents a 65 percent increase since 2013. More than 44 million Africans are estimated to be at a crisis or emergency level of food insecurity. Parts of Nigeria, Somalia, and South Sudan are at risk of famine. In the past year, 51 humanitarian workers have been killed in the Central African Republic, Kenya, Mali, Nigeria, Somalia, and South Sudan, impeding efforts to provide assistance. 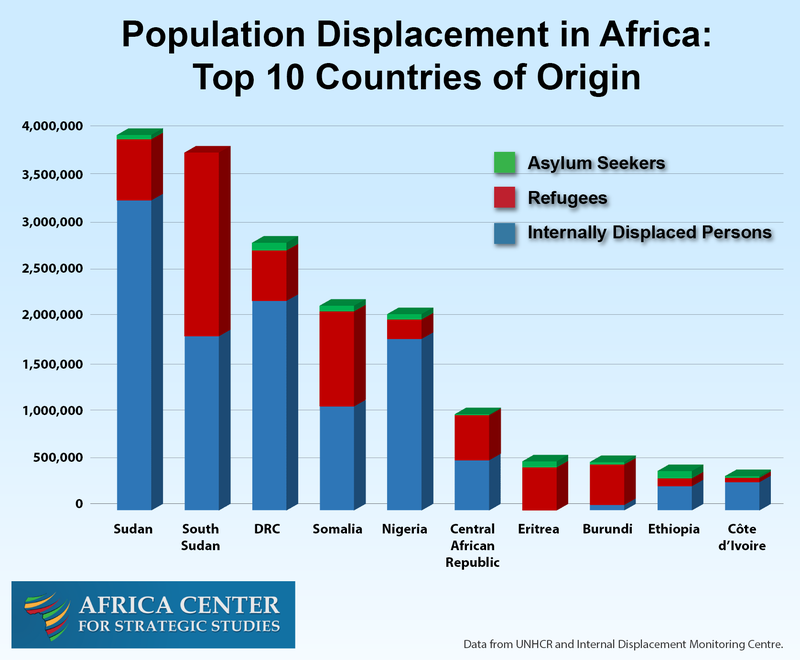 Eight of the top 10 countries of origin for Africa’s displaced populations have autocratic governments. Africa Center for Strategic Studies, “Burundi Refugee Flows Continue to Increase,” infographic, June 19, 2017. Africa Center for Strategic Studies, “Humanitarian Need and Displacement in South Sudan,” infographic, March 14, 2017. Africa Center for Strategic Studies, “Intrastate Conflicts Fuel Refugee Movements,” infographic, June 20, 2016. Malin Mobjörk and Sebastian van Baalen, “Climate Change and Violent Conflict in East Africa: Implications for Policy,” Stockholm International Peace Research Institute, April 2016.